Rucking (hiking or marching with a loaded backpack) is simple, cheap exercise. Throw some weight (20 lbs for beginners, 30 lbs for advanced) into a backpack and walk. 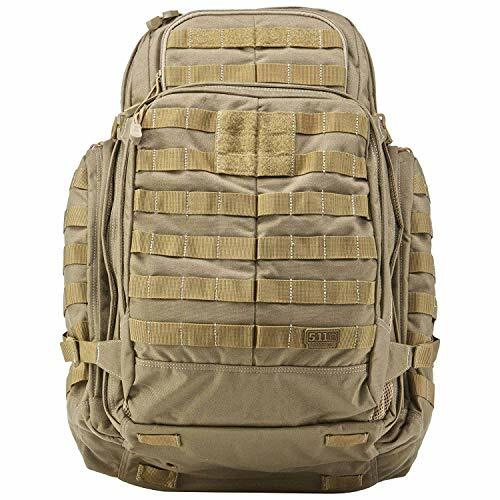 There are many options for rucksacks, but the 5.11 Tactical Rush12 (Buy on Amazon) and the other bags in the Rush line are particularly budget friendly. We’ll take a look at the models they have available, and what makes them the best budget alternatives for the ruck march or ruck event. Let’s look at backpacks that are cheap, but good. These aren’t the premium brand (GORUCK bags) that will break the bank – but they will work fine. These are the best budget rucksacks for 2019. Read on for all the juicy details of the best budget backpacks. The 5.11 Tactical RUSH12 Tactical Backpack is our budget pick for most affordable rucksack. This rucksack is typically offered for sale under $100. But, at the same time, it’s got the features we look for in the best rucking backpack. It’s got MOLLE (pronounced as “Molly”) webbing (known formally as PALS webbing), and lots of it. We can connect all sorts of accessories and pouches via MOLLE clips. The bag also supports 5.11’s proprietary SlickStick connectors. But MOLLE is more of a standard you’re going to see all over the place. With MOLLE webbing you can customize and configure for better ergonomics, or efficiency. This rucksack is made from 1050D Nylon. The “D” is for denier – and fabrics with a high denier count tend to be thick, sturdy, and durable. This isn’t super-tough 1000D Cordura used in the GORUCK bags. But, that’s OK. It’s 1050D nylon – so it’s easier on your clothes, it’s lighter, and it isn’t as stiff and unyielding. 1000D Cordura is also a lint-magnet – if that matters to you. 5.11 calls it water-resistant. That doesn’t mean waterproof. So invest in a good dry sack or rain cover if you transport items that simply can’t get wet. Or, wrap your gear in a contractor trash bag for a true budget option. The RUSH12 comes in these colors: Black, Double Tap, Sandstone, and Multicam. The Multicam model, shown here, is more expensive. “Double Tap” is sort of a dark blue and contrasting black color scheme. Most of the pictures in this article show the Sandstone color. Let’s talk about the shoulder straps – because you’re going to be lugging this with heavy weight for long distances. See those shoulder straps? They are wide, thick, and padded. This helps distribute the load across your upper body. Skinny straps dig in and that doesn’t help with the fatigue you’re going to feel in your upper body. It’s also got a sternum strap (chest strap) right out of the box. Having a chest strap let’s you cinch down the shoulder straps for comfort and to help reduce fatigue. By adjusting the chest strap you can vary the precise placement of the load on your upper body. It’s seriously nice to be able to do this while rucking – trust me. Again, the Rush12 is your value champ – the best bang for your buck. From the back view we can see two hook and loop (aka velcro) patch areas. Name tapes can go on the upper velcro and tactical patches or morale patches can go on the lower velcro. you can also see the grab handle on the top of the pack. This makes it easy to pick the bag up, and keep in mind if you are participating in a ruck challenge event – you might have to do PT with your bag. A good grab handle will help if you have to do ruck swings, or overhead presses, etc. You can also see the silent zipper pulls. This doesn’t mean the zipper is silent – that’s impossible. What it means is that these non-metallic pull tabs (or cords, in this case) won’t clink or jangle against anything to make noise. The zippers themselves are YKK self-repairing zippers. That’s what we want. And last but not least – let’s talk about backpack capacity. This bag is rated at 1,476 Cu. In. or 24 liters (24L) of volume. It’s in the same ballpark as the GORUCK GR1 – which comes in 21L and 26L varieties. Perfect “day pack” size for rucking. This is also a good size for Every Day Carry (EDC) – in the sense of using this to haul your laptop around, or similar (not CCW). This isn’t a “lay flat” packing bag. Those bags tend to be more like a big, empty suitcase. The Rush12 has a considerable amount of storage organization already built in. You don’t get to optimize storage yourself – as you would with a “lay flat, suitcase” style bag, but it’s gonna be easier to use right out of the gate. There is a fleece lined eyewear or gadget pocket. Perfect for storing your sunglasses or smartphone without fear of damage. That zippered pocket is also easily accessible. It’s got a front admin compartment for organization and easy access to things like: notebooks, pens, flashlights, multi-tools, keys, cards, etc. Some premium bags don’t really have an admin panel solution out of the box. So you have to buy something separate. The main storage compartment has zippered mesh storage and elastic-topped compartments keep your gear organized and ready. And of course, the Rush12 has a 60 ounce hydration pocket. You buy the hydration bladder separately. You can route the hydration tube on the left side or right side. 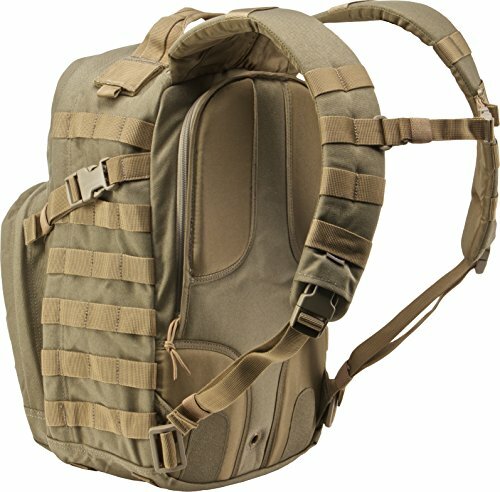 Do you need a hydration bladder for rucking? In my opinion, yes. You don’t want to have to stop, doff (“Take off”) your ruck, get a water bottle out, drink, and don the pack again. It’s an energy waster. It wouldn’t be a big deal on a short hike, but after about 5 or 10 miles your energy and endurance might be scarce. 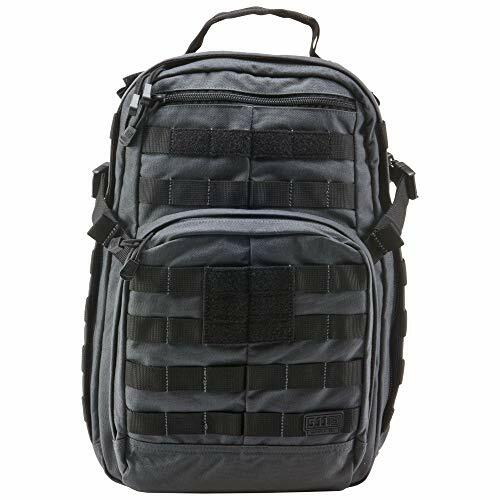 This bag, like all the 5.11 Tactical backpacks, carries a warranty against manufacturing defects for as long as you own it. That doesn’t cover abuse and normal wear and tear. But it does show that 5.11 stands behind their product. That warranty applies only if you buy via an authorized dealer. We recommend you buy direct from 5.11 Tactical via Amazon. 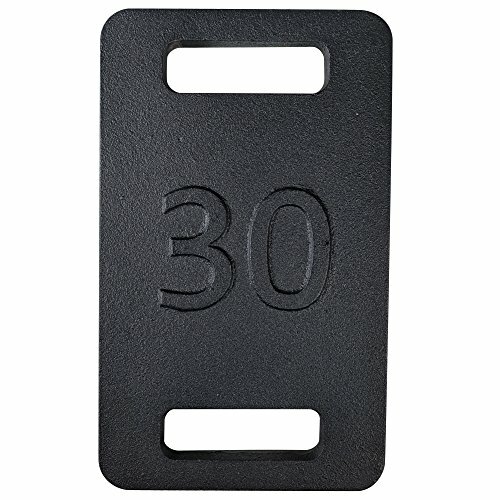 This item is very well liked by it’s users and comments indicate it is very durable over the long term. So, there you go. 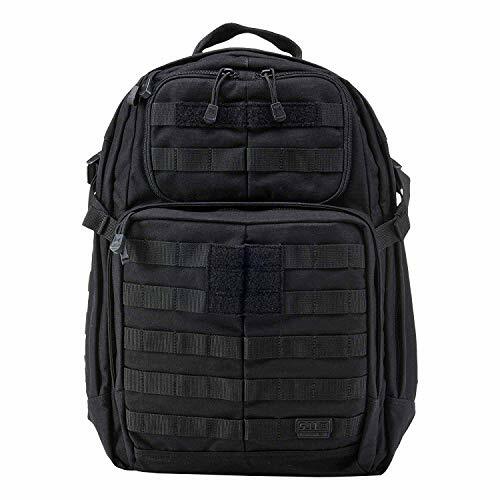 The 5.11 Tactical Rush12 is the best budget option for rucking. If you are dipping your toe in the waters of rucking and don’t want to jump into a $395 rucksack to start, get the Rush12. 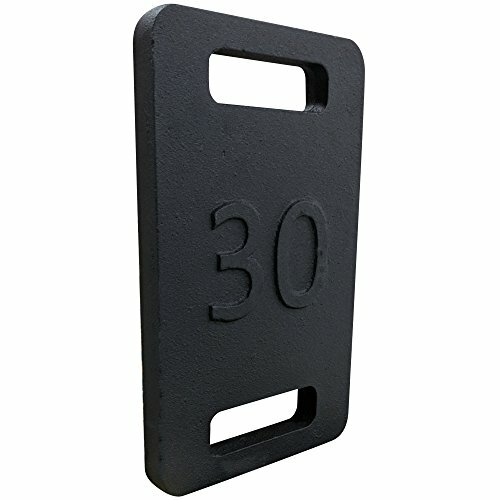 By the way, if you are going to do a ruck challenge event (light, tough, or heavy), or you simply want an efficient solution to help you train better, we recommend you look into ruck plates. These are budget friendly, easy to use, and space efficient training weights. These would be great to make weight for a ruck event, without wasting a ton of space in your pack. If you don’t want to pony up $$$ for these, use three bricks, or use dumbbell plates. If 24L of storage capacity isn’t enough, check out the 5.11 RUSH24 Tactical Backpack. By the way, the “24” is for 24 hour – or overnight pack – not capacity. As such it is 2,275 cubic inch or 37 liters (37L) in total capacity. It adds a few other features as well – twin drainage grommets (in case the bag becomes immersed in water), and a “Shove It” storage area. And lastly there’s also a 72 hour model. 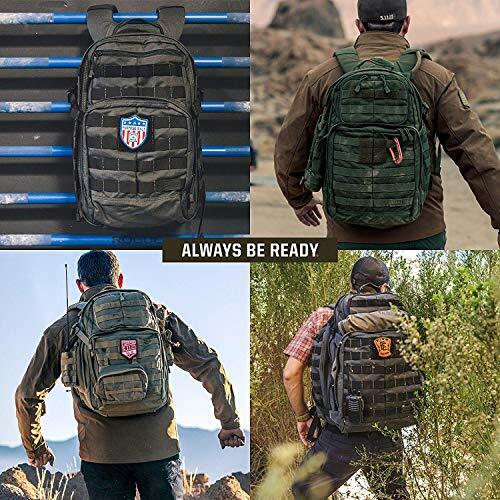 This would be the equivalent of the “3 day” packs that are popular, such as the London Bridge Trading 3 day assault pack, or the Mystery Ranch 3 day assault pack. This has all the great features of the other 5.11 Rush packs, but has a massive 3,342 cu. In. / 55 liter (55L) storage room. It’s also got a hip belt or waist belt built in. Use the waist belt when you want to offload some of the heavy load from your upper body to your hips. 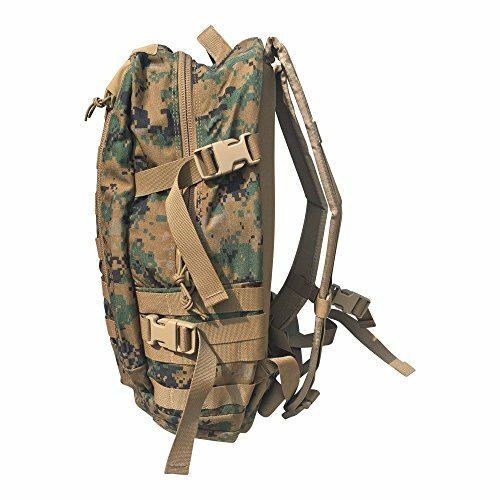 This helps reduce fatigue on long ruck marches. On a short ruck, the waist belt can be tucked away. Here’s another wallet friendly rucking option – with an authentic twist. 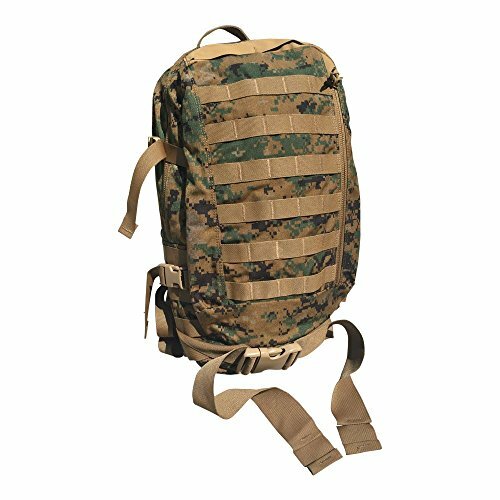 The USMC Gen II ILBE Digital MARPAT Assault Pack (Buy on Amazon) is right in the sweet spot for a budget rucksack. First of all this is genuine US military surplus – so you know if it’s tough enough for the troops it’ll work for your ruck event. ILBE Stands for “Improved Load Bearing Equipment”. At 1,500 cubic inches (24.5L) it’s perfect size for a ruck, comparable to the GR1. It’s available in one color: MARPAT (MARine PATtern) Digital Camouflage. It has padded shoulder straps, sternum strap, and hip/waist belt – all included – at no additional cost. And lastly, look at all that glorious MOLLE – just what we need. This item is actually made by Arc’Teryx – who makes a lot of great gear. 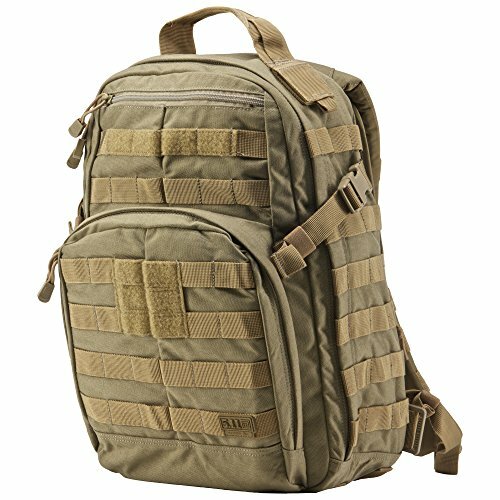 How about a sling style backpack like the 5.11 MOAB 10 (Buy on Amazon) or 6? These have their uses, but not for rucking. They aren’t really a robust load bearing solution. 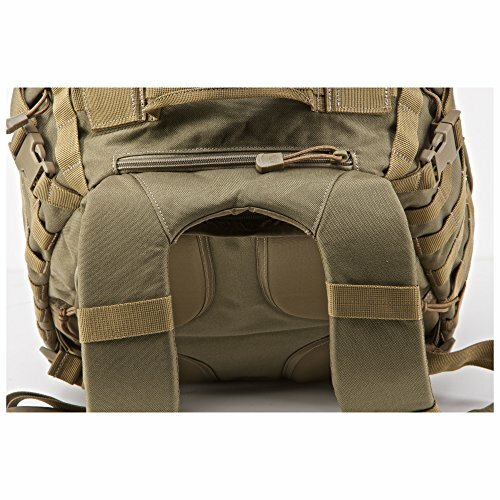 The MOAB 10 Shoulder Sling Bag is a fully customizable tactical bag with adjustable cushioned shoulder strap made of water resistant sturdy, lightweight 1050D nylon. 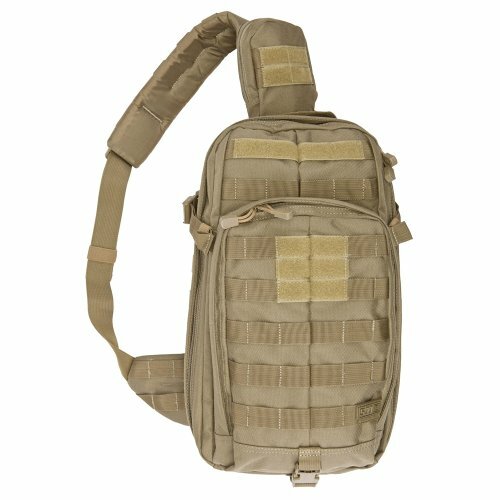 This Military sling pack is loaded with coms pockets at the shoulder, covert tactec pocket at the rear, and a secondary double zip pocket. The shoulder back pack sling bag is roomy with organized storage area. 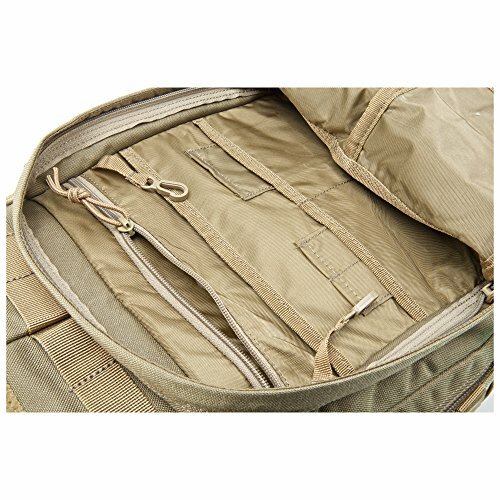 MOLLE ready sling pack has multiple interior admin and stash pockets and features a hydration pocket with pass through port. A sturdy grip handle and comfortable compression straps make this made ideal for an operational bug out bag. Equipped with 5.11 Tier System which integrates with other 5.11 RUSH tactical bags. Hook and loop flag patch, YKK self-healing zippers with a fleece lined sunglass pocket make this tactical sling bag ready for action. 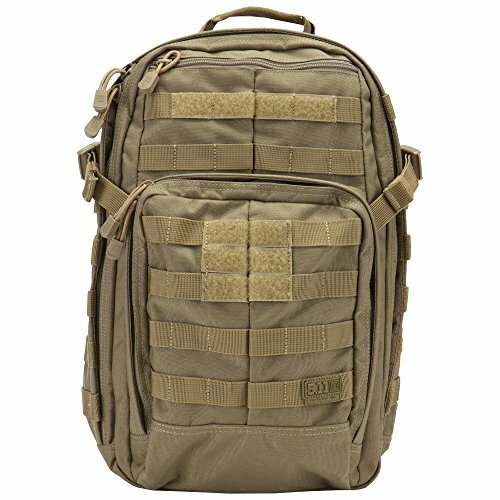 The 511 MOAB 10 sling bag backpack can be used as a multipurpose pack, survival bug out bag, range or hunting bag, army or military backpack, tactical sling pack, hiking rucksack, or as an everyday shoulder backpack. The main problem is that the single shoulder strap ensures any real load is going to cause that strap to dig into your shoulders. Check the reviews – and you’ll see. For lightly loaded EDC scenarios these sling style packs may have their use, and that’s what we’d recommend them for. By the way, MOAB stands for Mobile Operations Attachment Bag. And what is a sling bag good for? These sling bags can be worn to the front, keeping everything in view, or to the back and easily spun around to make them easy to work out of, or provide quick access to the concealed carry pocket. Please note that the MOAB 6 and 10 are not named for their capacity. The MOAB 10 is actually 18L capacity, and the MOAB 6 is actually 11L in capacity. They have a lot of features that we want for rucking, but won’t break your budget at the same time. If you want to get started rucking cheaply, 5.11 Tactical’s Rush series are your best options. For day trips, the Rush12 is sized right, but the Rush24 and Rush72 are also available for more storage. These also work great as a hunting bag, bug out bag (BOB), and for other uses. 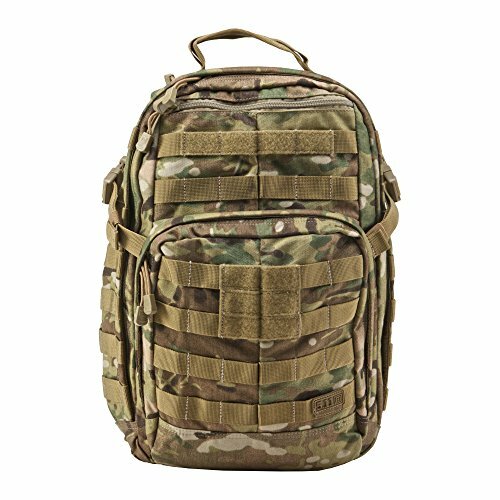 If you want a premium backpack, check out our article on the most expensive backpacks for rucking.